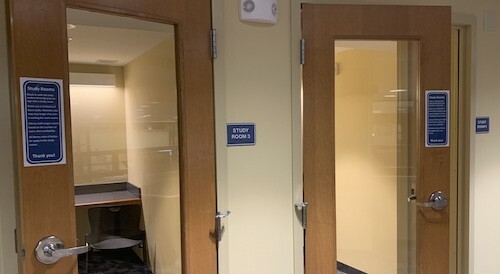 The Library has 4 study rooms available for public use. Room use is limited to 2 hours per day, but you may stay longer if no one else is waiting to use a room. Library staff assigns rooms based on the number of users, then availability. All library rules of behavior apply to the study rooms. Study rooms may be reserved 24 hours in advance by calling (203) 272-2245. 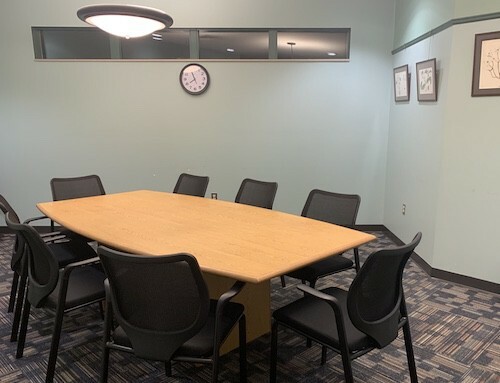 The Library has 2 meeting rooms available for public use. Please see the Cheshire Public Library Meeting Room Use Guidelines, Fees, and Application below. Fees shall be payable to the ‘Town of Cheshire.’ The Town reserves the right to waive any fees or requirements, at the discretion of the Town Manager, if the scheduled use of the facility is in the best interest of the Town of Cheshire or the community. Renters in Group I may reserve rooms or facilities for municipal use up to a year in advance based on availability, and may reserve with an application, a written request, or copy of the meeting notice/agenda. Renters in Group II may book up to three months in advance based on availability, with full payment where applicable, for a maximum of three month time blocks, although their application can be submitted annually. These groups may submit an application annually which will be held on file by the appropriate department head. Group III and IV users may book up to three months in advance depending on availability, for a maximum of three month time blocks, and must submit a separate application for each request with full payment based on the estimated number of hours that the facility is to be used. Due to heavy municipal and community use of rooms, consecutive monthly bookings and consecutive weekly bookings can only be accommodated by special arrangement with the department head whose department supervises or administers the facility or building. For all Town parks, facilities and buildings, a fee will be charged, in full hour increments, for any additional time used beyond the estimated and prepaid amount. For social events, a security deposit for damages or cleanup may be required at a rate to be determined by the department head and will be returned in full if no damages have occurred or no additional cleanup is required by Town crews. Damage and additional cleanup costs will be charged to the group using the park, facility or building. No future uses of the park, facility or building will be permitted until all costs for damages and additional cleanup have been paid in full. 1. A Certificate of Insurance naming the Town of Cheshire as an additional insured MUST be provided by all organizations in Group II, Group III and Group IV. Group II users may file an annual Certificate of Insurance. 2. No groups larger than the maximum occupancy per Fire Code will be permitted in any room. 3. No material may be affixed to wall surfaces without prior permission. 4. The Mary Baldwin Room (170 persons) and the Evelyn Moss Room (10 persons) may be scheduled for use during the hours the Library is open to the public. 5. Adults 25 and older may reserve meeting rooms. 7. Weather related cancellations must be made prior to 2:00 p.m. on weekdays. For weekend events, renters must call the facility representative by 2:00 p.m. on the Friday before the event if inclement weather is threatening the event to make arrangements in the case of a cancellation and at least three (3) hours prior to an event’s start time on weekends in accordance with the weekend arrangement procedures made at the time of reservation. If no notice of cancellation is given, 50% of the full rental fee will be charged. 8. Attendance at all meetings is open to the general public and may not be limited to group’s members or express individuals. 9. The group is responsible for setting up the room, returning the room to its original condition and complete cleanup afterward. 10. No custodian is available. 11. Refreshments may be served in the Mary Baldwin Room, but no kitchen facilities are available. 12. Alcoholic beverages may not be served. 13. Meeting rooms are available for use only when the Library is open to the public. 15. The group is responsible for maintaining order during its meeting or program such that it does not disturb the normal operations of the Library. 16. Library staff may require access to the room in use in order to obtain materials. 17. Damage, which is considered more than normal wear, shall be repaired by the Library and charged to the group using the room at the time the damage occurred. 19. Group participants shall use parking spaces that do not hinder the normal operations of the library. These parking spaces are available behind Christ Community Church (120 Main Street). 20. The Library is not responsible for equipment, supplies, material or other items owned and/or used by a group or individuals in the Library. Violations of any item(s) listed in these REGULATIONS may result in cancellation of future reserved dates and suspension of any use of a park, facility or building for up to one (1) year. Any appeals of cancellation and/or suspension must be referred to the Town Manager. In recognition of the valuable contributions made to the Town of Cheshire by many local organizations, this policy allows for the Town Manager to waive building use fees for such organizations. If your organization has a program or service that provides a direct benefit to the Town of Cheshire, a fee waiver may be considered for this rental application. The contact person indicated will be notified of the waiver decision. The Town reserves the right to rearrange or cancel use of meeting rooms. Applications must be received at least one (1) week before the event. Bookings can be made up to three (3) months in advance and may be made for three- month time blocks. You must reapply at the end of the three month period. Equipment available: 120 chairs, 20 tables, lectern, screen, public access system, large screen TV, VCR, DVD. Please request equipment in advance.The user must provide any other equipment.